Researchers aren’t the only ones who wonder what it would be like if humans could regrow limbs or if medical implants could be designed not just to replace tissue or organs, but to boost regenerative growth. That’s why Robert Guldberg, vice president and Leona DeArmond Executive Director of the Phil and Penny Knight Campus for Accelerating Scientific Impact, will discuss those questions and more during a community science talk, “The Future is Here: Bioengineered Medical Devices and Regenerative Therapies.” The talk will begin at 7 p.m. Wednesday, April 24, at the John G. Shedd Institute for the Arts. Free tickets can be reserved online. Guldberg, a bioengineer who focuses on regenerative medicine, arrived on campus last summer to lead the Knight Campus. Made possible by a $500 million lead gift from Penny and Phil Knight and augmented with $70 million in state bonds, the billion-dollar initiative is aimed at integrating research, training and entrepreneurship into a single, nimble, interdisciplinary enterprise. The first building opens next year. 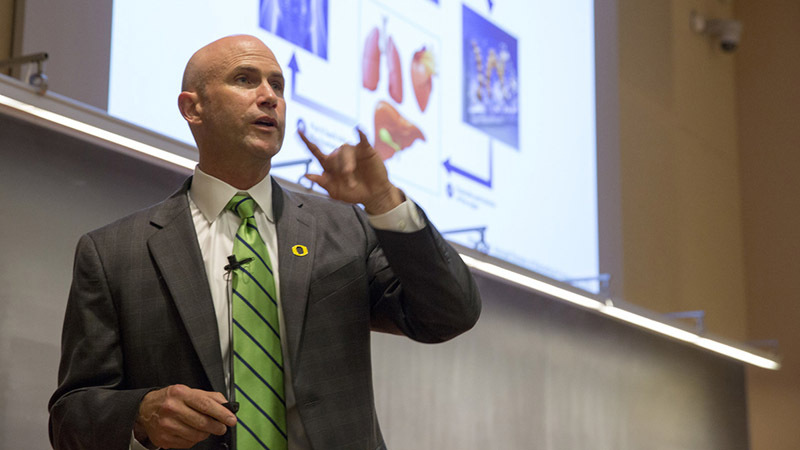 To set the stage for his talk, Guldberg discussed his research and other aspects of the Knight Campus. Q: How do you describe your research in basic terms? A: I study muscle and bone growth and development, focusing on potential regenerative therapies following traumatic injuries and the slowing or reversal of degenerative diseases such as osteoporosis and osteoarthritis. Q: You came here as a very established researcher. What additional research opportunity has coming to Oregon brought you? A: Shortly after accepting the position, I met Kryn Stankunas, a UO professor in biology. He studies organ development and regeneration in vertebrates. He uses organ regeneration in zebrafish as an inspiration for ways we might someday approach organ repair in mammals, specifically humans. His work in regeneration overlaps with my interests, and we’re working closely on potential collaborations. Q: You’re fond of saying “Science is a team sport.” How are you teaming up with partners around the state? Arriving here is also an amazing opportunity to deepen my relationship and collaborations with OHSU. Even in my years at Georgia Tech, I worked closely with researchers in OHSU’s Center for Regenerative Medicine. In 2008, center director Dr. Kenton Gregory and I helped establish the Armed Forces Institute for Regenerative Medicine, whose mission is to restore the lives of soldiers with battlefield injuries. Together, Dr. Gregory and I do research with the military involving traumatic limb injuries among soldiers and also severe injuries in civilians. Is our work in this field engineering? Yes. Is it medicine? Yes. Now, with the Knight Campus, the UO and OHSU are able to deepen their relationship with one another so both institutions — and ultimately society — can benefit. Q: What’s your favorite part of the building? At heart, I’m a researcher. I love the lab space we’ve designed. But, I’ll say it again, science is a team sport. So, I also love how the building is designed to promote collaboration, with open areas, light, glass walls and plenty of room for conversation and inspiration. More important than the building, my favorite part is really the potential of bringing together such amazing minds and people. With the Knight Campus internship programs and our executive leadership team as well as the professional staff in the Knight Campus, we’re well on our way to excellence. Q: Overall, how are you adapting to the Oregon lifestyle? I have to say the snow was quite the shock. Overall, my wife, Tina, and I are loving Oregon and Eugene. I have picked up trail running as a new passion and even got to go skiing a few times over the winter. When it comes to skis, I think it’s time for me to stop renting. I’ve been in Oregon long enough that I probably need to own my own pair. With spring, I’m also really looking forward to getting out on the tennis court.